If you haven’t heard yet, sitting will kill you. The posture in which most of us spend the bulk of our day has been linked to every life-threatening malady from heart disease to diabetes to cancer. One study found those who sat 8-11 hours a day had a 15 percent higher chance of dying within three years than those who sat less than 4. And that’s to say nothing of the risk for chronic postural problems and overuse injuries. Because most of our sitting is done in the workplace, a popular tool to combat this deadly habit has been the sit-stand desk, which allows you to vary your posture (it’s said that the best posture is one that’s always changing) and reduce sedentary time. The problem is they’re expensive, frequently complex, and not every workplace offers one as an option. The Varidesk is a compelling alternative: a height-adjustable platform that sits on your “fixed” desk. Unfortunately, some significant design flaws limit its usefulness. The Varidesk Single sits on top of your existing desk. The Varidesk comes fully assembled, and setting it up is as simple as unboxing it and hoisting it onto your desk. However, the single-monitor model we reviewed (dual-monitor models are also available) is a cumbersome 41.8 pounds, so that may be a two-person task. There’s no hardware to secure the Varidesk to your current workstation—it’s designed to balance its weight—so once it’s positioned, it’s merely a matter of loading your monitor, keyboard, and any other peripherals you want at hand. The most laborious part of setting up is making sure all your cable lengths will accommodate both sitting and standing positions. The Varidesk Single has a spacious 30-by-23-inch work surface that can hold up to 35 pounds, which was more than ample for my 24-inch widescreen monitor, keyboard, and mouse. 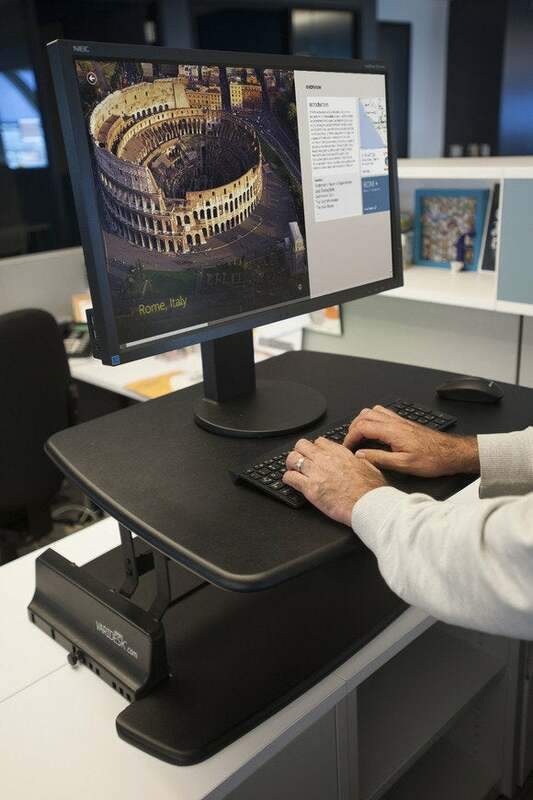 It’s also sturdy; if, in a moment of lapsed ergonomic awareness, you lean your weight on the Varidesk, you can be confident your monitor won’t crash to the floor. To change the height of the Varidesk, you release levers on either side of the platform and manually raise or lower it to one of 11 preset positions. It lifts with little effort thanks to spring assistance, but lowering it takes some muscle, especially to get it in the bottom-most slot. This is not a stealth maneuver, though: The clanging as you release the side levers and lock the platform into place is guaranteed to alert any coworker within earshot that you’re changing position. 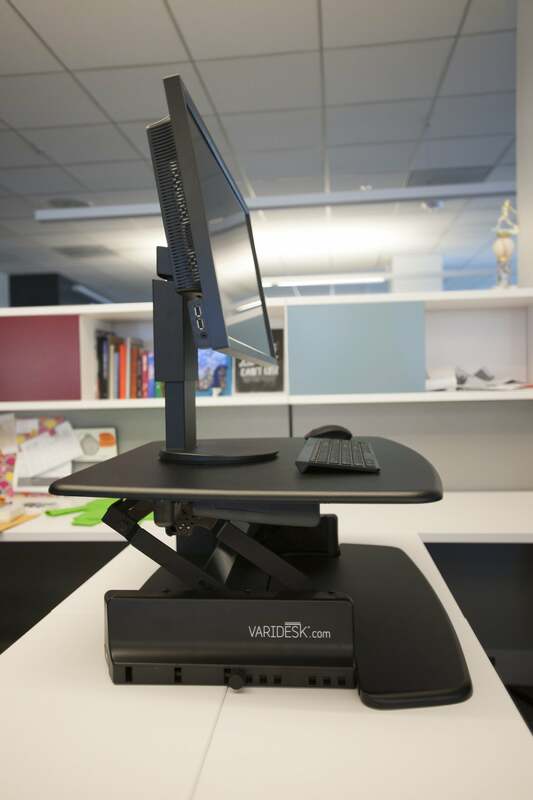 Varidesk trumpets that its adjustable height desks can get you from a seated to standing position in three seconds. 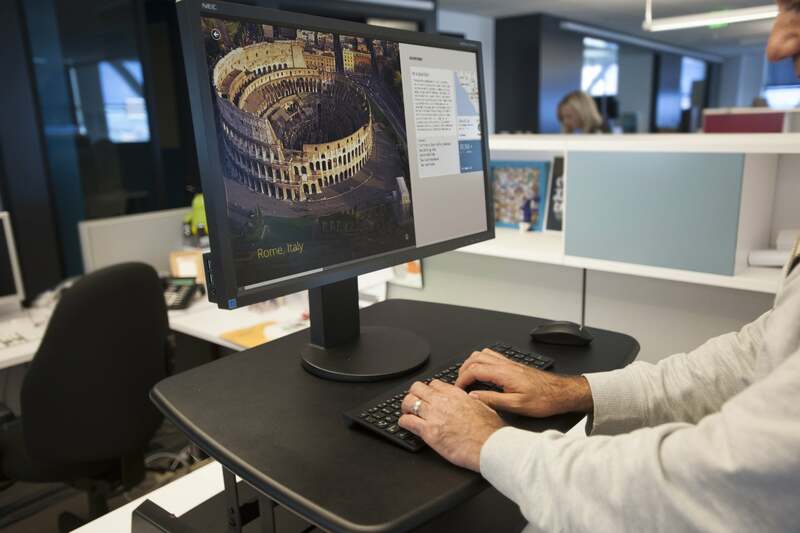 Technically that’s true, but because the monitor and keyboard can’t be adjusted independently, getting to an ergonomically correct standing position—and back to a seated one—takes considerably longer. It quickly became clear the Varidesk’s 11 positions aren’t enough to accommodate all statures. At 6 feet tall, I needed to use the Varidesk in its fully extended position—15.5 inches above my regular desk—to get the height that would let me position my elbows at the optimum 90-degree angle. Even then, I had uses two risers to elevate my monitor so that the top of the screen was close to eye level. And because the work platform moves out as it rises up, I had to push the entire Varidesk back from the edge of my desk to get the recommended 20-30 inches between me and my monitor—and to keep it from pushing me back into my chair and the file cabinet directly behind it. The Varidesk is easy to set up, but it doesn't offer enough adjustment for proper sitting and standing. But when I lowered the Varidesk to sit, I had to remove the risers and move the monitor forward to get the proper viewing height and distance for a seated position. Because the platform comes to mid-chest level when fully lowered, the keyboard and mouse need to be moved to the Varidesk’s keyboard tray, which slides straight out (but not up or down) with the turn of a couple of thumbscrews. All that shuffling of peripherals gets tiresome, especially if you want to change positions once each hour of the workday, as is commonly recommended. As a result, you’ll probably end up leaving the Varidesk in one position, likely the most comfortable: sitting. The Varidesk Single retails for $275, making it an attractive entry point to workplace wellness. If you’re intrigued by the fad, it’s a fairly risk-free way to find out if you like working on your feet. You’ll get the best results if your desk isn’t boxed into a cubicle and you use a wireless keyboard and mouse. If you’re committed to the idea of a sit-stand desk, however, the Varidesk Single is tough to recommend. Comparably priced desk-mountable workstations such as the Ergo Kangaroo Pro Junior and the Ergotron WorkFit-S allow you to move your monitor and keyboard separately, creating a far larger range of adjustability. They also slide vertically, making space less of a consideration. Compared to those options, Varidesk’s bulky platform seems downright primitive. Varidesk Single is a solid entry-level adjustable desk, but it's size and design quirks prevent it from being a long-term sit-stand solution.